The Thunder and Eastern League announced this morning that RHP Ronald Herrera has been named the Eastern League Pitcher of the Week for the week of June 5 - June 11. Herrera went 1-0 this week with a victory over the Hartford Yard Goats on Thursday night as part of a 5-1 homestand for the Thunder. In that start, Herrera allowed a single with two outs in the first inning then retired 16 straight batters before surrendering a second hit to the Yard Goats. In all, Herrera went 6.2 innings and struck out nine allowing only those two hits in a 9-0 Thunder victory. Since his activation from the disabled list on April 30, Herrera has made eight starts and earned the win seven times. In 50.1 innings he's allowed 29 hits (.166 BAA), nine walks and struck out 41. The 22-year-old from Maracay, Venezuela leads the Eastern League in ERA (1.07), Wins (7), WHIP (0.75), BAA (.166), and fewest baserunners per nine innings (39 in 50.1, 6.97/9). Tuesday's recognition by the Eastern League marks the second such award for Herrera. 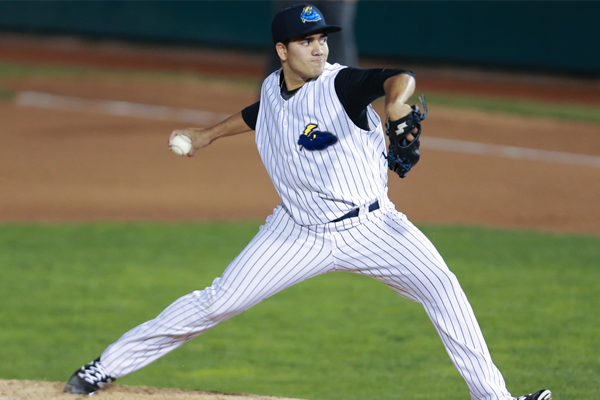 In 2016 he was named the Pitcher of the Week following his performance against the New Hampshire Fisher Cats when he and Jonathan Holder combined to throw the first nine inning no-hitter for the Thunder at ARM & HAMMER Park. Herrera is the fourth different Thunder pitcher to earn the Eastern League's weekly award following Chance Adams (April 6-16), Yefry Ramirez (May 15-21), and Justus Sheffield (May 22-28). This matches the Thunder franchise record with the 2008 season when four Thunder pitchers earned the weekly award (Alfredo Aceves - May 25, Phil Coke - July 20, George Kontos - August 3, Victor Zambrano - August 24). It's the third time in franchise history that four different Thunder pitchers have won Eastern League Pitcher of the Week (2007). The Thunder begin a three game series at Hartford on Tuesday and return to ARM & HAMMER Park on Friday, June 16 for a five-game series with Erie Seawolves. For tickets and the latest information on Thunder baseball visit www.TrentonThunder.com.